Belhaven’s Cross Country team gained two extra-ordinary runners this year. But one of them doesn’t run. He rides, usually with a sucker in his mouth and the wind blowing his hair. It’s never been out of the norm to see Coach Christie Barber (’97) running with the team, but not only is she back with son Truman in a jogging stroller, she is competing with the team. When she found out she had one year of eligibility left, Christie jumped on board the Cross Country team with her usual grit and determination. And Truman came right along after her…well, technically he led the pack in his mom-powered stroller. Since 2001, Christie Barber has been building the Cross Country team, both physically and mentally. She has always been an integral part of the team, so the transition from only coach—to coach AND teammate—has not been as difficult as one would imagine. In fact, Senior Jessica Gunning views it as an advantage. For all involved, the 2008 season has been a learning experience. The team members have learned a lot about developing their strengths to continue their growth as a team next year. The women’s team saw the most successful year they have ever had, claiming a hard-earned victory over cross-town rival Millsaps College at the Jackson State Invitational. The men’s team has young talent, so this was a building year for them. They fought hard for their placements, and with discipline and effort, they did see improvement during the season. At the Mississippi College Invitational, Belhaven claimed sixth place out of eight teams on the men’s side, while the women registered a fourth place finish out of seven teams. Despite some challenges, the experience gained by this year’s team should pay dividends next fall. 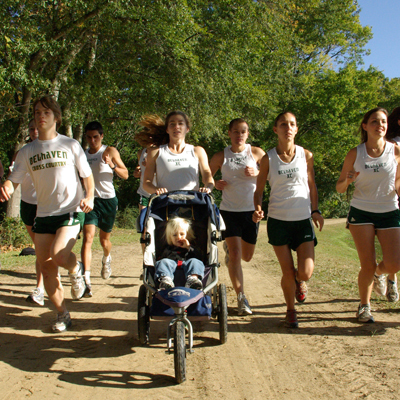 For more information about the Belhaven Cross Country team or other Blazer Athletics news, schedules, or statistics, go to Blazers.belhaven.edu. Hiya, I’m really glad I’ve found this information. Today bloggers publish only about gossips an. A good blog with interesting content, this is what I need. Thank you for keeping this website, I’ll be visiting it. Do you do newsletters? Can not find it.